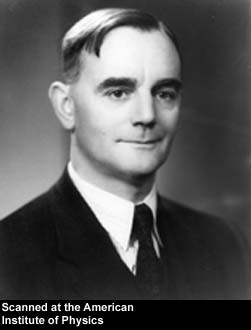 Cecil Frank Powell, FRS (5 December 1903 – 9 August 1969) was a British physicist, and Nobel Prize in Physics laureate for his development of the photographic method of studying nuclear processes and for the resulting discovery of the pion (pi-meson), a subatomic particle. Powell was born in Tonbridge, Kent, England, the son of a local gunsmith, and educated at a local primary school before gaining a scholarship to the Judd School, Tonbridge, which now has one of its four houses named after Powell (the house colour is green), and awards the Powell Physics and Mathematics Prize to an upper sixth form student every year in his honour. Following this he attended Sidney Sussex College, Cambridge, graduating in 1925 in Natural Sciences. After completing his bachelor's degree he worked at the Cavendish Laboratory, Cambridge, under C.T.R. Wilson and Lord Rutherford, conducting research into condensation phenomena, and gaining his Ph.D. in Physics in 1929. 1 2 3 Frank, F. C.; Perkins, D. H. (1971). "Cecil Frank Powell 1903-1969". Biographical Memoirs of Fellows of the Royal Society. 17: 541. doi:10.1098/rsbm.1971.0021. 1 2 3 4 5 6 7 8 9 10 Nobel Lectures, Physics 1942-1962. Amsterdam: Elsevier publishing Company. 1964. Retrieved 14 September 2009. ↑ "Nobel Prizes and Fellowships". bristol.ac.uk. Retrieved 14 September 2009. ↑ "Cecil Powell". Goethe-Universität Frankfurt. Johann Wolfgang Goethe-Universität Frankfurt am Main. Retrieved 14 September 2009. ↑ "Powell, Cecil". Encyclopædia Britannica. London: Encyclopædia Britannica Limited. 1962. ↑ "The Nobel Prize in Physics 1901-2000". nobelprize.org. 9 February 2000. Retrieved 14 September 2009. ↑ Lattes, C. M. G.; Muirhead, H.; Occhialini, G. P. S.; Powell, C. F. (1947). "Processes Involving Charged Mesons". Nature. 159 (4047): 694. Bibcode:1947Natur.159..694L. doi:10.1038/159694a0. ↑ "List of Fellows of the Royal Society 1660–2007: K-Z". royalsociety.org. Archived from the original on 9 June 2008. Retrieved 14 September 2009. ↑ "The Nobel Prize in Physics 1950". nobelprize.org/. Retrieved 14 September 2009. 1 2 "The First Pugwash Conference". pugwash.org. Retrieved 14 September 2009. ↑ "The Origins of the Russell-Einstein Manifesto by Sandra Ionno Butcher" (PDF). Pugwash History Series. Council of the Pugwash Conferences on Science and World Affairs. May 2005. Retrieved 14 September 2009. ↑ "Award list". ras.ru. Retrieved 14 September 2009.